Running a business doesn’t come with a job description, and often it involves dealing with unforeseen stresses and challenges, and lack of control. Whilst conducting research for this article it became evident that a vast array of options are available to support the business, including finance, grants, marketing and IT support, but hardly any focus on supporting the business owner or leader. You cannot always share problems with family members, and sharing with employees is often inappropriate. So where do you go, and who do you ask, to help solve the multitude of challenges and problems that come your way on a regular basis? It depends on where you are on your personal and business journey: an entrepreneur in start-up mode; running a stable, established business; or going through growth and change? 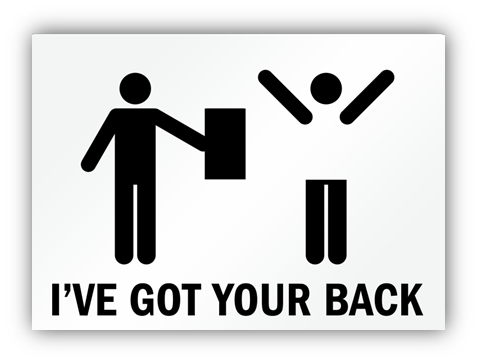 Depending on where you are, your support needs will vary. It can be difficult to select the best option, and once you’ve selected it how long do you stick with it? It is easy to become comfortable with people you are working with, so how do you recognise when you need to move on? The diagram below depicts a range of options, ranging from informal to formal, that business owners may wish to consider. At the early stage of a business, many entrepreneurs rely on their existing networks for support and advice – family and friends, people they know in the industry, and maybe their accountant. This is fine for a while, but as the business establishes and begins to grow so does the complexity of the issues, and support needs change. Business network groups are often the next step, for example Chambers of Commerce, and Business Network International (BNI). Such groups usually provide both networking and educational opportunities, and can offer significant support in evolving a business from a ‘solo-preneur’ to becoming a small-medium business. Considering 97% of all Australian businesses are classified as small (0-19 employees) , and 60% of small businesses cease trading within three years, this a critical stage for every business. During this early growth stage Consultants and Advisors play an important role, providing expertise ‘on demand’. Once the business has transitioned from small to medium (20-199 employees) , support needs change. At this stage the options considered include joining a CEO network group, engaging an Executive mentor, or perhaps establishing a “pop-up” or informal Advisory Board. CEO network groups, such as The Executive Connection (TEC) and the CEO Institute, offer business coaching and leadership mentoring in a group forum, usually comprising a monthly group meeting and a one-to-one with the group Chair. A major benefit of this form of support is alleviating the feeling of isolation many business owners feel, being part of a group of ‘peers’ on the same journey, however the flip side is you are one of a group of 12-15 CEOs, therefore only a limited portion of time is spent discussing your specific challenges. The next logical step is to engage an Executive Mentor or Business Coach, who is focused entirely on your business for the duration of the engagement. 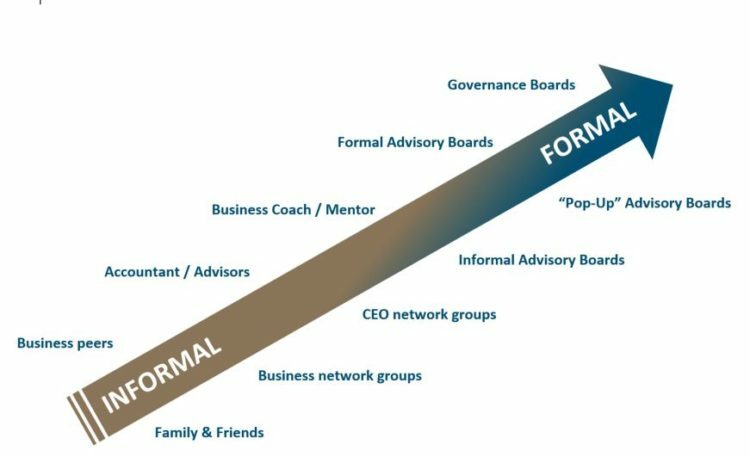 Informal advisory boards have been in existence a long time, however the concept of a ‘pop-up’ Advisory Board is relatively new. With informal advisory boards members are usually selected form within existing networks, often the business Accountant, a Lawyer and possibly an industry connection. These start well, however often lose momentum due to lack of structure, accountability, and inability to evaluate the impact or measure the return on investment. Moving along the formality spectrum are formal advisory boards and governance boards. The purpose of formal advisory boards is to solve problems, providing a forum for critical thinking and robust conversations in an environment of trust. They should be established following a thorough business growth and board readiness assessment, and a rigorous Advisor selection process. The result is the right people around the table to ensure productive conversations and fresh perspectives. The advantage is that the business owner retains control, using constructive advice to aid decision making. And finally, governance boards. Mainly the domain of larger organisations, governance boards are focused on compliance, setting the strategic direction, determining risk appetite and making decisions. Whatever stage you are at on your personal or business journey, make sure you get the support you need – at the right time and from the right people. 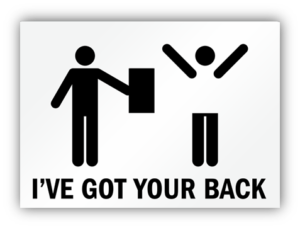 Make sure the right people have got your back!